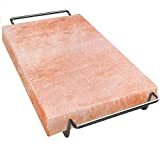 The cool new Himalayan Salt Plate Grill Press slips onto a heated Himalayan salt grilling block (sold separately) transforming it into a hefty grill press that helps hold down and flatten steaks, chicken, and more for even cooking, while also imparting a subtle gourmet salty flavor. 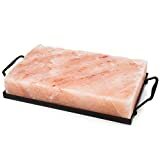 Creates a press that holds food flat on the grill while imparting subtle salty flavor. 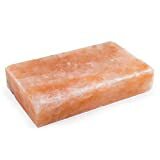 Caution: Salt plate press will get very hot on the grill. Use grilling mitts or gloves when handling.